Updated info is available here. A 22-year-old woman was sexually assaulted, robbed, and threatened with a knife in the alley behind the former Brompton Auto Body, 3532 N. Halsted, around 4:30 Monday afternoon. 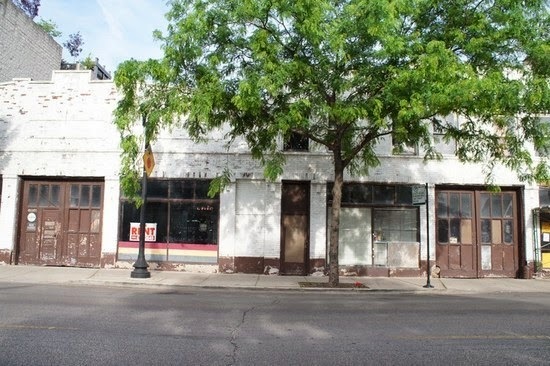 The former Brompton Auto Body garage at 3532 N. Halsted. Police say the victim was threatened with a knife or razor during the attack. Officers have collected "plenty" of evidence and leads, including "good" video of the offender we are told. The victim's cell phone, which pinged from Reta and Cornelia 15 minutes after the attack, found its way to the South Side Back-of-the-Yards neighborhood within an hour. The woman sought help after the attack at a nearby Caribou Coffee. One witness there reports that she had also been beaten. The offender is described as male, black, in his mid- to late-20's. He has a stocky build, a "wide face," no facial hair. He was last seen running northbound in the alley toward the nearby Circle K gas station. In addition to sexually assaulting the woman, the offender robbed her of her black iPhone5 and her wallet. The attack happened next to a truck used by construction workers who are believed to be working on the conversion of the old auto body shop into a Children's Learning Palace day care center. Police have recorded the attack as a criminal sexual assault with a knife/cutting instrument in CPD case HX223458. Officers drove the victim to Illinois Masonic Medical Center for treatment. EDIT 11:31PM: Removed CPD's earlier clothing description as new information indicates that the details are "off." UPDATE APRIL 15 2:15PM: Added detail.